View Bangla In Mobile Web Browser - 1 October 2011 - Blog - ..: JOYNAL'S HOUSE :.. The Number of Mobile Phone user is increasing day by day. The number of Bangla Website is also increasing. But Bangla is not clearly Visible in Mobile Phone. 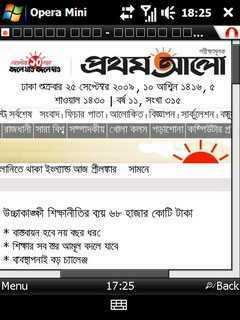 The Person who possesses Java Enabled Mobile can see Bangla Website with the help of Opera Mini Web Browser. For this, at first download Opera Mini from the following Site (www.opera.com/mini) & Install it. Now starting Opera Mini, write about: config at Address-bar. Then Power-User Setting page will appear. 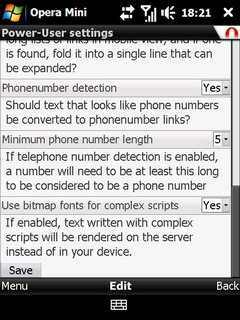 Here You will see that the option of "User bitmap fonts for complex scripts" is "No". Now You have to change it as "Yes" & Click Save. Now You can successfully see Bangla Website.